This project addresses an historically important commercial center, the large and underused Sears & Roebuck warehouse and grounds, in the Boyle Heights neighborhood. A major development opportunity for Los Angeles, the project is situated on 23 acres at Olympic Boulevard and Soto Street. The vision includes an urban plan that unifies eight separate parcels of land, creating a new town center development with reuse strategies for the existing nine-story structure, which was designed by George C. Nimmons in 1927. Moule & Polyzoides directed a 23-firm effort that was organized in a six-phase development plan. The final design includes 620 housing units, 750,000 square feet of office and retail space, and parking for 3,100 cars. The project establishes a large public plaza as the centerpiece of the complex which, along with an interconnected network of streets, provides a rich and varied public realm. In the future, a large riverside park will link the Los Angeles River and commuter rail lines to the site. 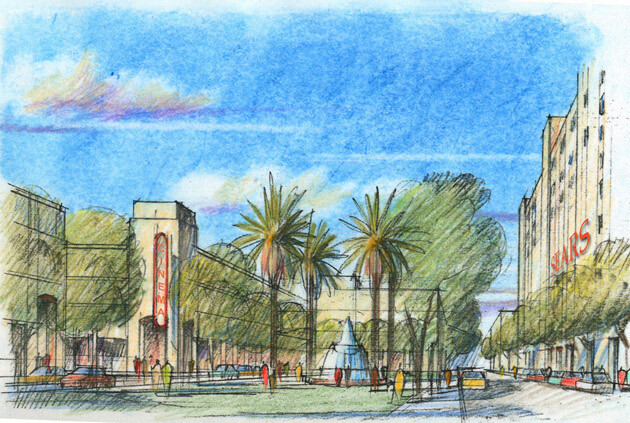 The project creates a valuable shopping, working and institutional center for an underserved community and creates a distinct gateway to East Los Angeles.